I have always been a lover of Quadrille's Climbing Hydrangea wallpaper and this design by Tilton Fenwick with the lavender colorway is just completely delightful. Lavender + green might be my favorite color combination of all time. 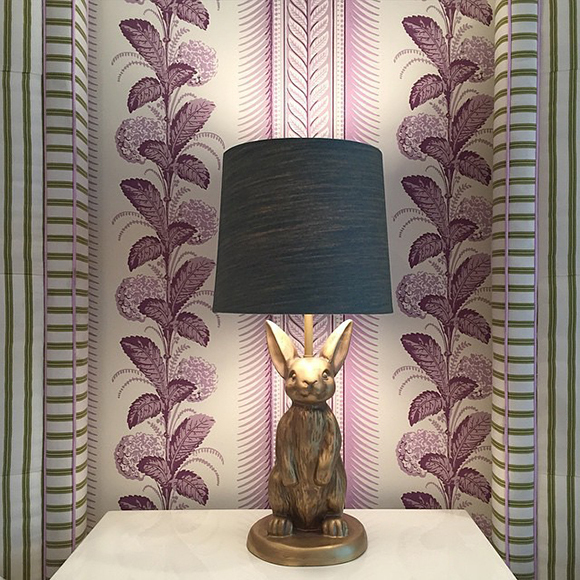 And this composition is just perfect, perfect for a child's space with that adorable bunny lamp. Happy that the weekend is here so I can catch up a bit on the mundane tasks of life after being away on vacation. Hope it's a good one for you...see you next week! I love that bunny lamp, so cute!